Fans of marble shooter and puzzle games like Sparkle, Tetris, and Jewels will enjoy Rake in the Grass’s new action puzzler, Phantasia. This puzzle game is a nice twist on the classics. Phantasia can be played in two modes: adventure and arcade. The adventure mode will have you saving dwarves in 30 levels with graduating difficulty. Whereas, in the arcade mode, you’ll try to collect as many points as possible in one arcade level. Personally, I prefer the adventure mode because I feel like I’m gaining more achievements with advancing different levels. The adventure mode feels like all the repetitive moves with no reward. The aim of the game is to free fairy dwarves that are imprisoned in colored bubbles by an evil wizard. The bubbles are placed in a long set of lines, with different lines stacked on top of each other (exactly like a column-row configuration). You’ll try and eliminate the different rows by firing different bubbles you get at bubbles close together. If you hit the bubbles with two or more of the same color bubble touching, all bubbles of that color will be destroyed. Any dwarves will also be released if they are in the same line. Coins may also drop that you can collect to increase your score after you destroy any row. The best part is that you can gain different spells/power-up bubbles that will help you release the dwarves sooner. This game offers a decent gameplay experience, and it’s on the same level as most other puzzler games. It doesn’t get points for originality but it performs well in other areas. Controls are inuitive, easy to use, and highly responsive. 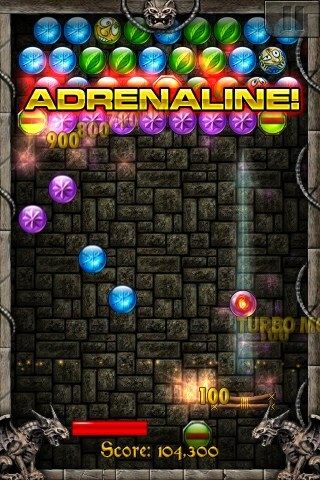 There is little delay between the time your fingers will hit the screen and when a bubbles is shot. Shooting bubbles to release dwarves is good fun, and the sound effects and soundtrack make gameplay addictive. I especially enjoyed the cheers the dwarves made when they were released. It made me feel like a hero. What’s also nice is that you can change the music and sound volume from the menu at the beginning. Change whether you want the status bar to show on the same menu. The graphics are also better than most puzzle apps. The characters look hand drawn and they colorful and polished. All these features are great, but the game could be made better. I’d like to see integration with OpenFeint or other social networking clients like Facebook and Twitter. It would also be nice if I could directly send e-mails and challenges to friends. Online local and global leaderboards would also be a good addition. I’d also like to see more backgrounds like they have in Sparkle. And if possible, short comments made by the evil wizard would be welcomed, and they would add to the gameplay by encouraging users to continue. These changes would increase the addictive qualities of the game and may convince more people to buy. Phantasia offers is a good value at $0.99 for the hours of replay you’ll get from it, but if you already have a puzzle game you love it’s not worth getting this one. AppSafari review of Phantasia was written by Linda Ta on April 2nd, 2010 and categorized under Action, App Store, Fun, Games, Puzzler. Page viewed 3215 times, 1 so far today. Need help on using these apps? Please read the Help Page.